We've had some Magic School Bus Science fun recently! Our latest science kit had us exploring and experimenting properties of Air. We did most of the activities in the kit and my son loved every one! I always help and do the activities with my son, but this kit needed the most parental participation as there were candles involved and the use of our gas stove. This experiment took a few attempts to get right; I think we were both nervous about the outcome! While still holding the cardboard, we flipped the cup over. To "see" air in action, we let go of the cardboard. Voila! The cardboard stuck to the cup!! My son cut along the dotted lines on the template they provided to make a spiral snake. We put it above a heat source and observed that the warm air made the snake move. After we learned that oxygen is needed to keep a fire burning, we did an activity using two tea lights, a large glass jar, and a small glass jar. We lit the tea lights and then put the glass jars over them. We predicted which candle would burn out faster and we were right, the candle in the small jar. This is because the small jar had less air, so its oxygen was used up faster than the larger jar. We learned how a fire can be put out with chemicals. We put a tea light candle in a bowl. 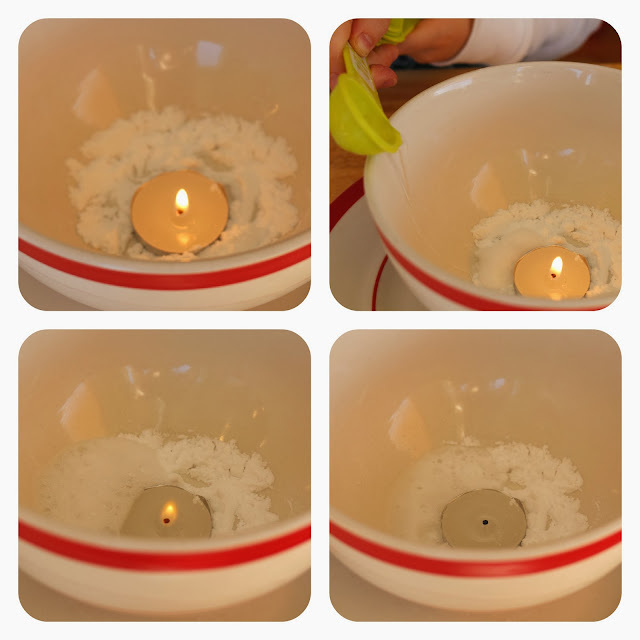 We added a tablespoon of baking soda around the candle. Next, I lit the candle. Then my son added a tablespoon of vinegar... See the photos to observe what happened! By adding baking soda to the vinegar, we made a gas-- Carbon Dioxide. Since Carbon Dioxide is heavier than air, it surrounded the candle and pushed the air out of the bowl. Just prior to this experiment, we learned that fire needs oxygen to burn. With oxygen no longer surrounding the candle, it can no longer burn. We had never made one of these before and the kiddos LOVED it! Big Brother and Little Sis both exclaimed, "Whoa!" when the balloon went flying across the string. It was an easy set-up activity, although it was a bit tricky getting the string through the straw. Once the string was through the straw we taped the ends of the string to two chairs. We blew up a balloon and closed it with a clothespin. Then taped the balloon to the straw, took the clothespin off, and watched it fly! Have you done any of these experiments before? These were all new to us and we had a great time!